Community comes in many forms. For me, coming out in the early eighties and quickly finding my way as a lesbian writer, one type of community became the anthology. It has always been reassuring to me to know that I can walk into a queer bookstore and find my friends-if not in the aisles, then on the shelves. The anthology is that much of a community and more. When I open the pages of one I have written for, I find myself in the company of other writers-some of whom I know well, others who I have met at conferences and festivals, and still others whose work I am familiar with or have just been introduced to. This has been my experience many times over the years, most recently with the publication of Sinister Wisdom's special book-length edition about lesbians experience with Death, Grief and Surviving. Sinister Wisdom was founded in 1976 and is the one of the oldest surviving lesbian literary journals. 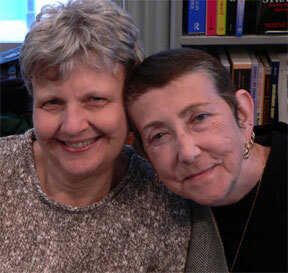 This double issue is co-edited by Judith K. Witherow with her long-time partner, Sue Lenaerts and in the introduction Judith remarks that -- despite the fact that death is the one certainty in life-"the overwhelming majority of writing on coping with illness or death is geared toward the heterosexual community neglecting what often are some of the most difficult aspects for Lesbians." Loss is a defining issue not only for individuals but for entire communities (for example, consider the AIDS epidemic of the eighties and nineties had on the gay community). The writers in this collection, claiming the losses in our lives and in our communities, include Janet Aalfs (former poet laureate of Northampton, MA), writing about the late poet and activist Gloria Anzuld`ua (who died in 2004); the late writer and photographer Tee Corinne writing (shortly before she herself was diagnosed with a terminal illness ) about the death of her partner of sixteen years; and widely known lesbian play write Carolyn Gage writing on the tragic suicide of two young lesbians who lived in a small town in Maine. Others write about the loss of partners and ex-partners who they are still connected to; the loss of children, of mothers, of fathers, of close friends, and even of pets. It is interesting to note that the lack of legal rights-and the subsequent consequences-financial loss, custody suits, the insults and injustices of being denied the proper place in a partner's life and death, is not dwelled on. And, of course, it is not that these experiences did not happen to the contributors of this collection, but that the most powerful experience was the loss itself. Italian American poet Maria Fama writes eloquently about the loss of her long-term partner, in her poem "Why I don't Play Guitar Any More." Beginning her sleep toward death. Jean Sirius, lesbian poet prefaces her piece "How It Was"-with insight gleaned from her experience of caring for her long-time partner. I never forget that I was very lucky. I had eighteen years of something some people never have for five minutes. Unlikely as it sounds, my partner's death was the happy ending; we stayed together; we worked things out; we didn't give up. When you love somebody, you give a hostage to fate. Sooner or later, if you keep at it, somebody's going to die. And if you love her, it doesn't matter if you've had five weeks or fifty years, it's always too soon. The last words Cara said were "I love you." The last words she heard were "I love you." She died with my hand on her heart, and if she'd held on another two weeks, she'd have taken me with her. We would have many new things to talk about. We could begin with Sappho, who had a mother and a daughter, both named Cleis. The three of them contained a certain universe. My mother was the first woman in my life, and as her only daughter, I was the last woman in her life.